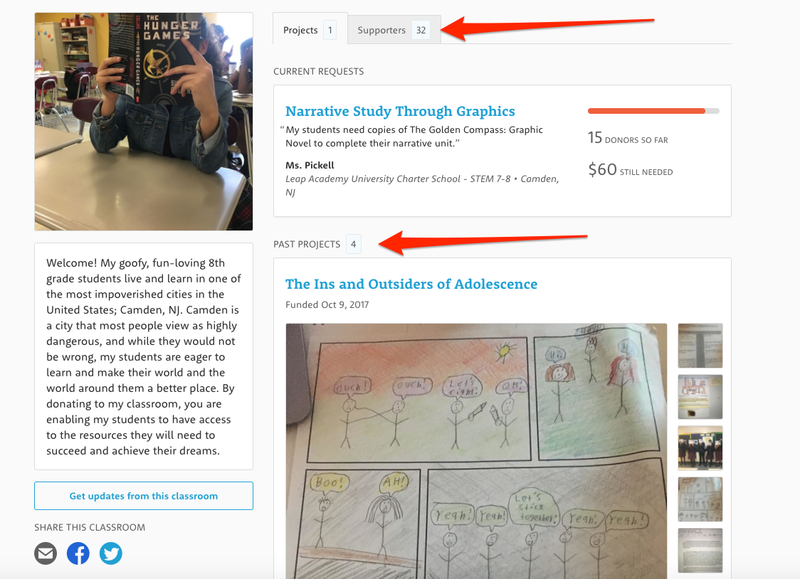 If your job is to help grow a crowdfunding site, then I’m sure you’d love project creators to gain as much exposure for their projects as possible, right? 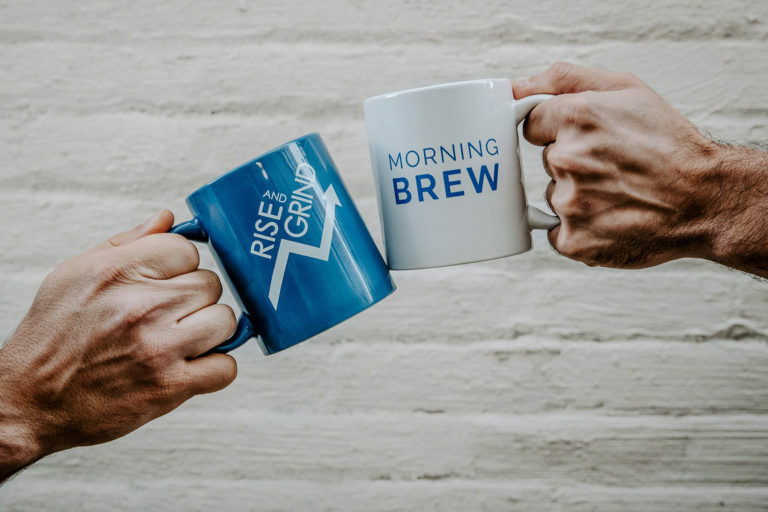 After all, every time they share their crowdfunding projects with people in their network, for example, their chances of reaching the funding goal grow exponentially. The responsibility for this happening lies entirely with you. Just think about it – Your users don’t know how to optimize projects for the broadest reach. Nor they’re aware of the best ways to convince friends or family to help them out, be it by donating or spreading the word on the project further. That’s why they’ve come to you. And they expect you to help. Luckily for you, in this post, I’ll show you exactly how to do it. 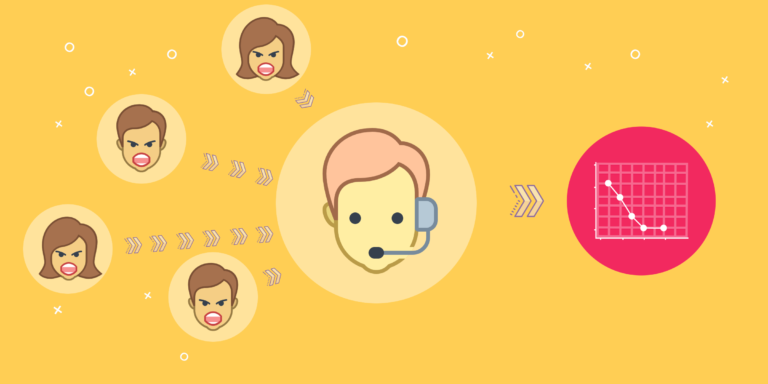 You’ll learn five different strategies to implement to help users utilize personal connections. Their “territorial social capital” – people who reside close to the project’s creator. In short, it’s the personal network of friends and family that provides the foundation for a project to succeed. By supporting the project early, friends and family help send a strong credibility signal reassuring many other potential funders about the project. Projects that acquired at least some funding seem more important to potential backers. Early funders often also spread information about the project, magnifying its reach. First backers provide useful feedback that helps project creators improve their content and presentation, increasing chances for more funding. And all this simply means that the easier you make it for users to convince their immediate network to participate and fund projects, the greater their chance for reaching the funding goal will be. 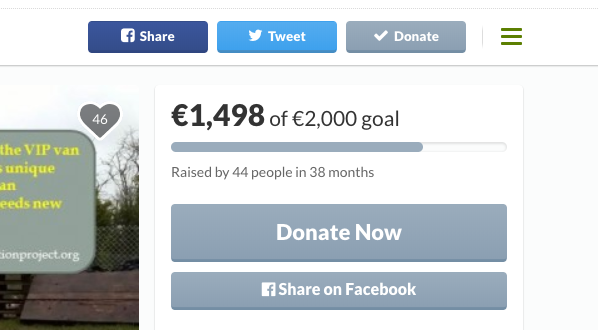 Interestingly enough, we hear similar stories from crowdfunding sites using CloudSponge. So, let’s take a look at some ways you could help your users achieve similar results. #1. Create thorough guides explaining how to share projects properly. I guess a myth persists that to fund a project you just need to put it up on a crowdfunding site. The reality, as you know very well, is entirely different. With so many projects created each month, creators must understand how to optimize their idea for the broadest reach. Heck, or even just to stand out from any other projects their network might discover on their own. Help your users achieve this by creating thorough guides explaining how to set their projects up for success and communicate the value of helping out to their network. 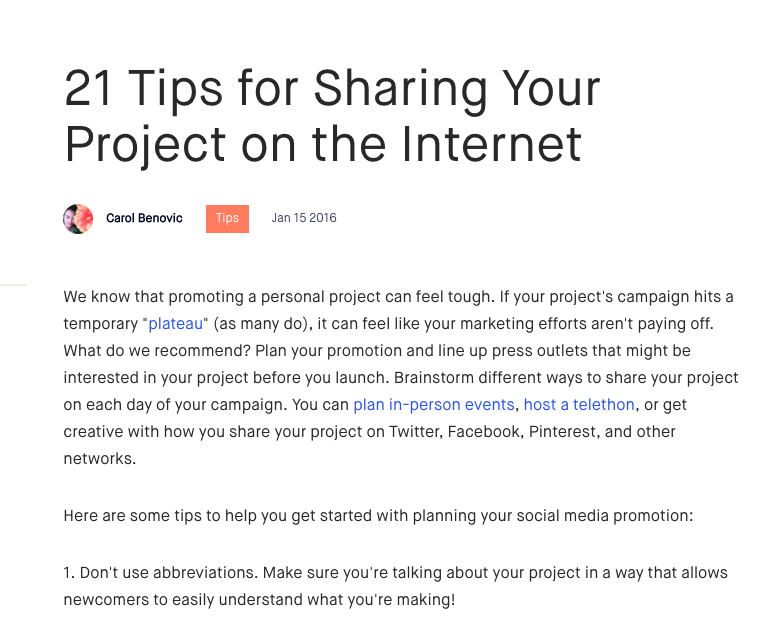 Kickstarter, for example, offers their users 21 tips for sharing their projects. Their resource includes advice on anything from reminders about the most basic elements project creators tend to forget about, to tips for making use of referrer data to spot additional opportunities. But I admit the Kickstarter’s guide is nothing but a collection of tips. You, however, could go much further and create dedicated guides to various aspects of sharing a crowdfunding campaign. #2. Provide ready-made copy that would help them inform their connections about the project. Fact: How we ask for something determines the outcome we get. Be it asking for help or money; our success largely depends on the arguments we make to convince someone to participate. Now, I don’t think it’s too far-fetched to assume that your users don’t know how to convince their friends to help with the project. As a result, many would resort to simply sending someone a link to the project, hoping they’ll figure out what a person wants them to do. And only a few ask for help directly. Luckily, you can help here too. Provide a ready-made copy, optimized for the highest possible success they could use or modify, if needs be. But I’m sure you’ll agree that actually pre-populating it with a short copy that would help creators inform someone about the project would work much better, no? 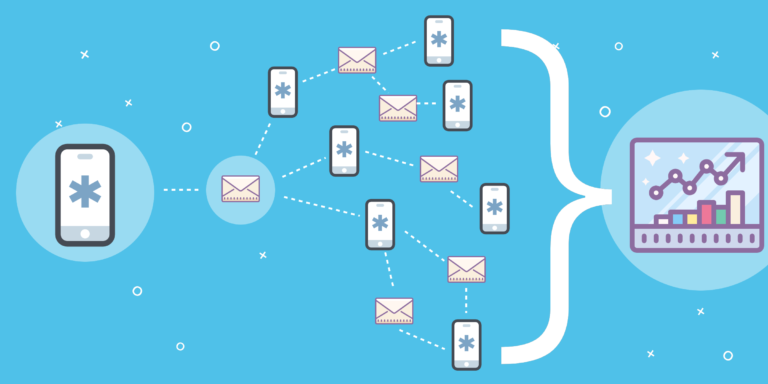 Notice how the above copy quickly introduces the project, explains why they receive the email and even promises a reward for participation – pictures and thank you notes for the support. Now, I admit that these findings pertain to product-based projects. Nonetheless, donations and other crowdfunded projects might face similar challenges due to a person’s potential lack of competence in completing their ideas. To help them overcome that friction, allow users to create profile pages and automatically showcase their past crowdfunding successes on your platform. 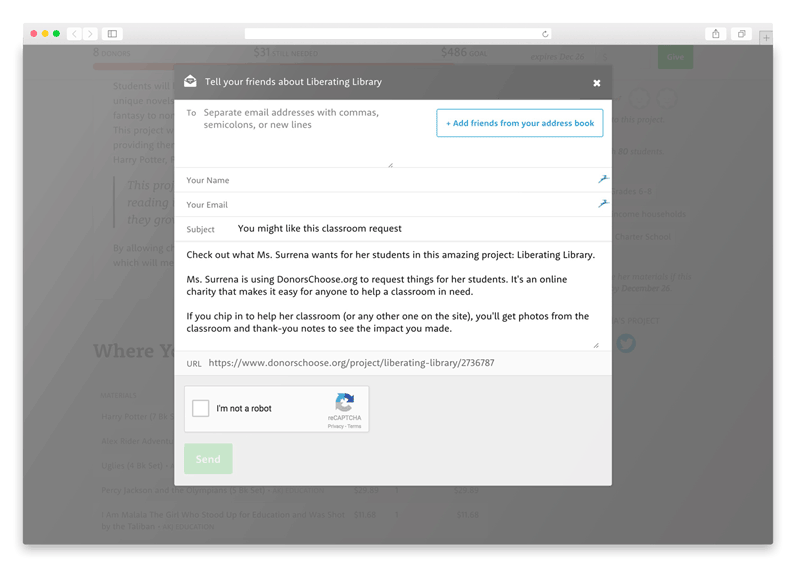 For example, DonorsChoose.org offers the ability to share projects on social media and via email. And simplifying the process even further by allowing users to upload their address books to the system effortlessly turned out to be one of the milestones for the company. Indiegogo allows users to embed a project on your site. 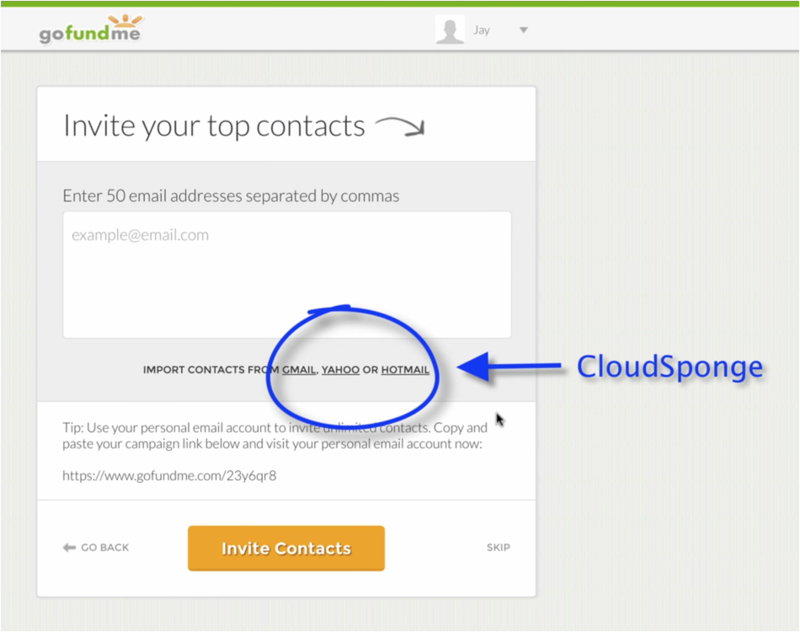 However, they don’t seem to have the email sharing option. 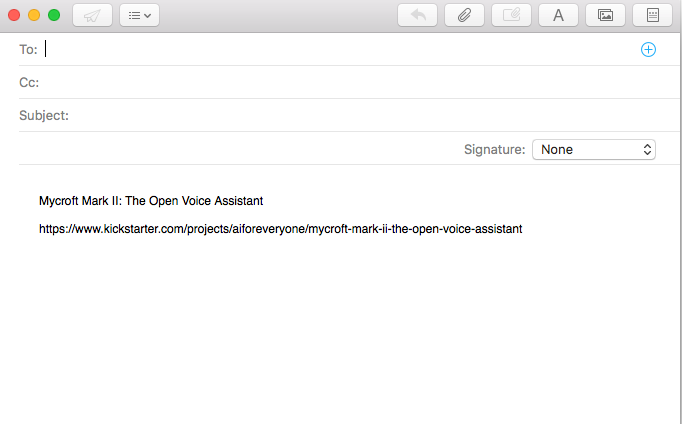 Leetchi on the other hand includes all sharing options – social media, email as well as a custom project link. Regardless of which channels you choose, your goal is to make it as simple as possible for both project creators and their first backers to share it. This goes without saying: Most of us are super busy. And so, it’s easy to imagine that many other things might occupy your project creator’s friends’ attention. As a result, they might not back the project right after receiving a notification about it. And even with the best intentions, simply forget to do it later. One way to overcome this is by enabling reminders notifying project creators that someone they notified about a project hasn’t backed it up yet. They could, in turn, send them a project reminder or simply use the personal connection with the person to inquire about it. Your users stand a far greater chance of reaching their funding goal once they get friends and family to help. But it’s your responsibility to help them do that. And in this post, I showed you five different strategies you could implement to help users involve their personal network.